Sporovsky peatland reserve & Ramsar Site is Europe's largest pristine peatland, and one of the target sites of project activities in Belarus. 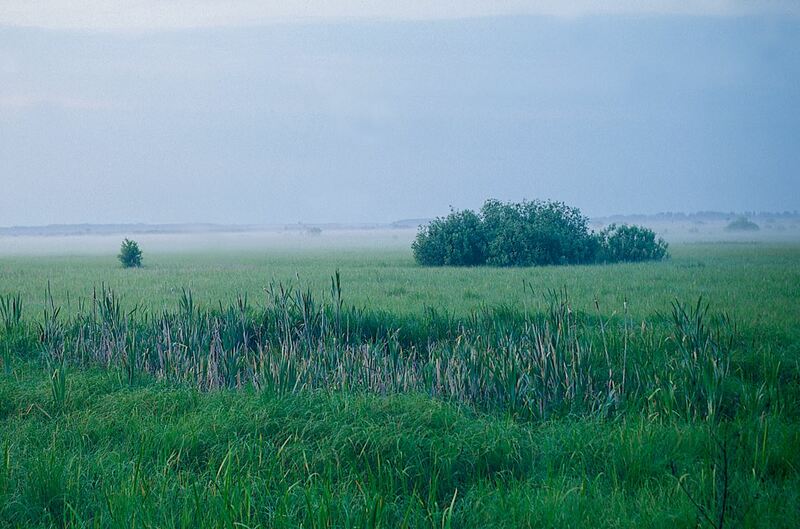 Before the 1950s, some 2.5 million hectares of the land surface of Belarus were occupied by natural mires – a diverse assemblage of wetland ecosystems representing the most extensive peatlands in Eastern Europe outside of the Russian Federation. In their natural state, peatlands perform critical ecosystem services relating to the hydrological cycle, soil protection and climate regulation, and serve as significant stores of carbon. These peatland ecosystems are of global importance, and, as of early 2017, Belarus is home to at least 26 sites designated under the Ramsar Convention on Wetlands, 51 Important Bird Areas under BirdLife International standards, and eight important plant areas. Today, only 863,000 ha of the mires in Belarus remain in good condition ecologically. Between the mid-1950s and 2002, nearly 1.5 million hectares of pristine peatlands were drained and damaged, and some 400,000 hectares severely, by unsustainable and poorly-managed peat extraction, as well as large-scale conversion for agriculture and forestry. Extensive areas of worked-out peat mines and denuded lands lay abandoned, and continued to dry out, effectively turning them into tinder. They began to burn, resulting in massive emissions of carbon dioxide, loss of livelihoods and biodiversity, risks to human health and heavy economic costs to the Government in fire-fighting costs, and damage to land and its dependents. From being the ‘Land of Mires’, Belarus had become one of the top emitters of greenhouse gases as a result of the degradation of its once-bounteous and vital peatlands. Over the past decade, UNDP and the Global Environment Facility (GEF) – along with BirdLife Belarus, Germany's International Climate Initiative and other project partners – have supported the Government of Belarus in the implementation of two projects focused on the restoration of degraded peatlands. A major achievement of this project has been the approval by the Belarusian Council of Ministers of the Strategy for Sustainable Use and Conservation of Peatlands. This Strategy serves to balance national interests in respect of the environment and sustainable economic development, whilst fulfilling commitments under the Convention on Biological Diversity (CBD) and the Ramsar Convention.